The engraved nickel plating was beautiful, but Jenny liked the tapered grip even more. She’d fired big pistols before, but she’d found the grips too big for her hands. These fit perfectly. Find your favorite Arkham Horror investigators springing into action and confronting unknowable horrors. Beginning with Hour of the Huntress—available now—our new Arkham Horror novellas bring your investigators to life like never before! You've stepped into their shoes. You've accompanied them for battles with cultists, monsters, and Ancient Ones. And you've steered them through the multi-layered mysteries of Arkham Horror, Eldritch Horror, Elder Sign, Mansions of Madness Second Edition, and Arkham Horror: The Card Game. But you've never seen them like this—grappling with their choices and uncertainties, pitted against unthinkable evils, and fighting for their lives as they unravel the mysteries that forced them to come face to face with the Mythos for the first time! 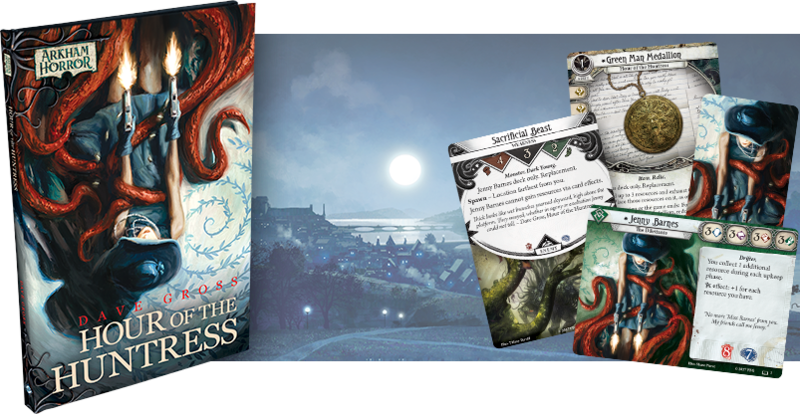 In addition, each Arkham Horror novella unveils a secondary window into its mysteries—with a full-color insert of notes, fliers, newspaper clippings, book excerpts, letters, and more of the in-universe artifacts and text in which the story's investigator finds his or her clues. And just as these images beckon you towards a deeper experience of the story, each novella comes with five exclusive cards for Arkham Horror: The Card Game that allow you to gain a more rounded appreciation of the character's talents in that game. 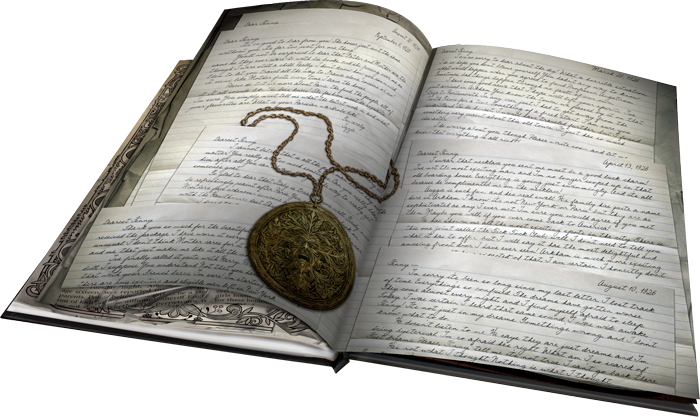 There's no question that the Arkham Horror Files universe has been heavily influenced by the works and world of H.P. Lovecraft. Both feature stories set in sleepy, coastal New England—rooted among the quiet, wooded hillsides and punctuated by the flappers and bootleggers of the Roaring Twenties. And both have a tendency to peel back the ragged veil between our world and the strange realities beyond human comprehension. They challenge us with truths we cannot ignore. Truths concerning humanity's infinitesimal significance in the greater cosmos. And terrifying truths about merciless powers—the Ancient Ones—that we cannot unlearn. It was a crude depiction of a man’s face, rough as though carved into a long-eroded stone. The man’s hair and beard appeared braided, but Jenny knew that what seemed like braids in this crude print were willow fronds. She’d seen the same image on a medallion she owned, one she had paid a Marseillais jeweler to duplicate for Izzie. They were two of a kind and—as far as Jenny knew—only two. But the Lovecraftian mythos and the Arkham Horror universe are nearly as different as they are similar. It's all about attitude. Arkham Horror is a place of terrors, to be certain, but it's also a setting full of unlikely heroes willing to act against danger. These are not the wilting protagonists of Lovecraft's slow, simmering stories of dread. These are action heroes—clever, brave, resourceful, and more than willing to squeeze off a few rounds to see if the monsters can bleed. Now with Hour of the Huntress and the rest of our upcoming Arkham Horror novellas, you can find these daring investigators treated with the same love and respect that they received in The Investigators of Arkham Horror—but within the context of a full, book-length investigation. You'll be able to get inside their heads as noted authors explore their personalities, backgrounds, fears, and motivations. You'll see them in action. You'll recognize their strengths and weaknesses. And you'll recognize their iconic accoutrements, as well as the stories behind them. Finally, it's not just the insight you'll gain into these investigators that will help you bring them more fully to life within your favorite Arkham Horror Files games. 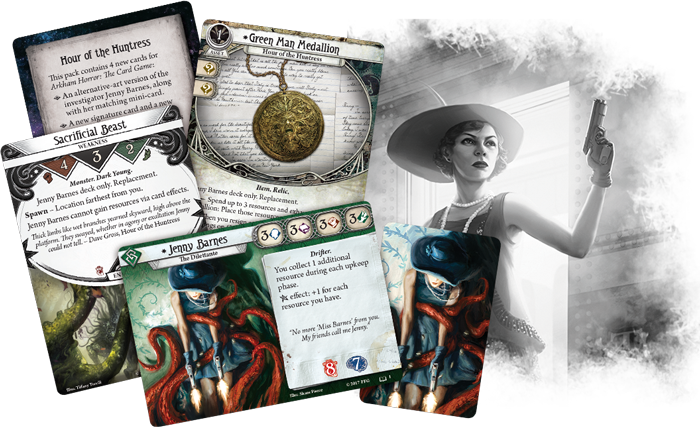 Each Arkham Horror novella comes with five cards for Arkham Horror: The Card Game that are exclusive to the novella—one rules card, one alternate art investigator, the investigator's alternate art mini-card, and two never-before-published signature cards for the investigator, both of which feature the "Replacement" keyword that allows you to use them in place of the investigator's normal signature cards. Guinevere "Jenny" Barnes never guessed that she would be returning to America so soon, or under such circumstances. Arkham, Massachusetts, is a far cry from Paris, but after her sister’s regular correspondence became increasingly deranged—then ceased entirely—Jenny couldn't shake the feeling that something terrible had happened to Izzie. As Jenny begins the search for her sister, she quickly realizes that Isabelle isn't the only girl in Arkham who has gone missing. How might the disappearances be connected? And why do the flyers for the local harvest festival depict the face from a medallion Jenny sent to her sister? Izzie’s trail leads Jenny from jazz-filled speakeasies to the dusty alcoves of the famed Miskatonic University. And as it becomes increasingly clear that Izzie's disappearance is tied to dark events, Jenny realizes she must make allies among the strange and secretive citizens of Arkham or risk losing her sister forever. Written by Dave Gross and set in the Roaring Twenties, Hour of the Huntress is full of e.e. cummings, loud jazz, and knee-length dresses. And while it plucks Jenny Barnes out from your games of Arkham Horror and Eldritch Horror to drop her into action against cultists, mobsters, and monsters, this novella offers you a rare chance to get inside Jenny's head as she follows her leads, ensuring you'll enjoy the drive, resourcefulness, and sass that make her such a popular heroine. Join Jenny Barnes on her quest to find her missing sister, and lay bare the secrets of Arkham. With his steady command of pace, author Dave Gross slowly opens your eyes to the darkest of the city's truths—and to the terrible truths of the things beyond. Prepare yourself for truths that can never be unlearned. 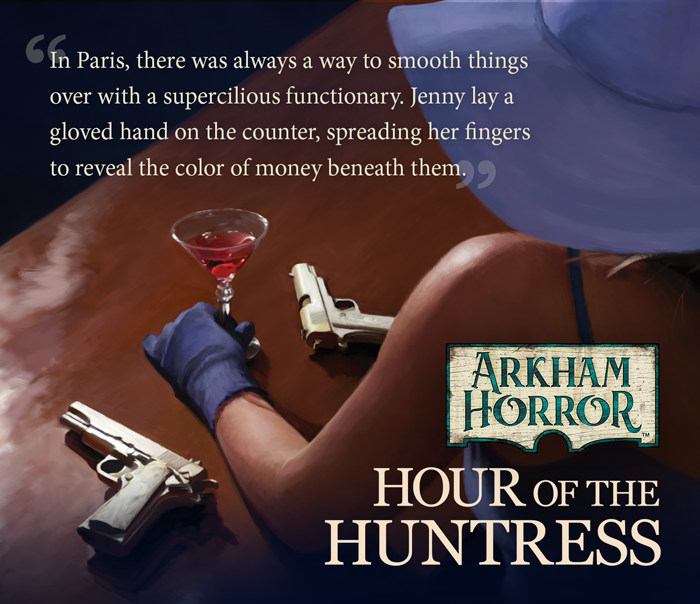 Hour of the Huntress (NAH10), the first of our new Arkham Horror novellas, is now available. Order your copy today!